The Velocity Micro Cruz tablet is now shipping. 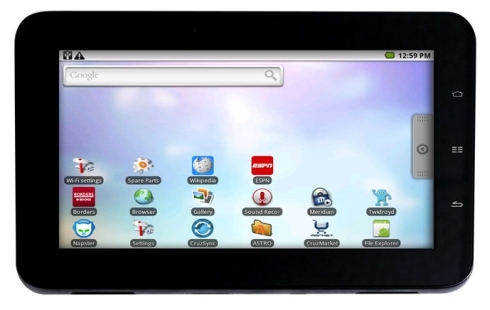 Its a nice 7 inch Android tablet which brings most of the tablet features for a low price. It has a 7 inch, 800 x 480 pixel capacitive touch screen display and runs Android 2.1. It is loaded with 512 MB of RAM and 4GB of storage. It also sports a 8GB SD card expansion slot. It supports 802.11b/g/n WiFi and also has an accelerometer for automatic screen rotation. However the tablet does not have the Android market so you will have to load apps or download them from the custom CruzMarket app instead of Google’s larger Android Market. Previous TiVo iPad App Coming Soon!